Any supper that has the words “steak” and taco” in it pretty much has me at hello, and this recipe for lime steak tacos is no exception. 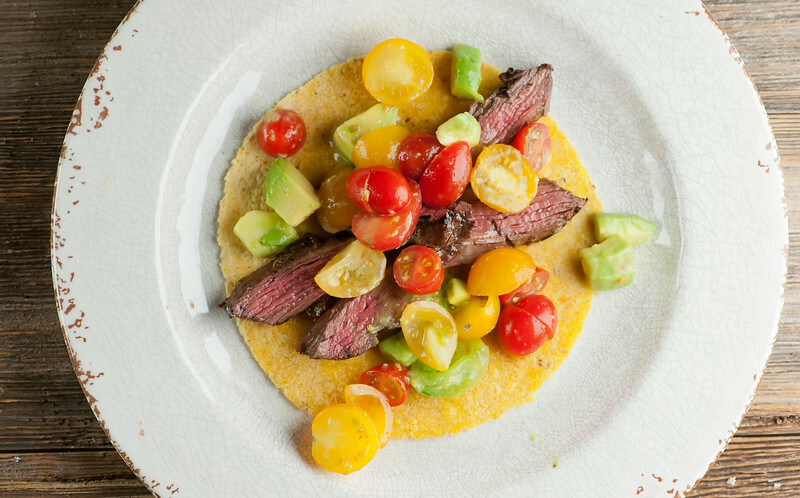 Because while I could cheerfully eat plain steak in plain tortillas and be a happy girl, when you marinate the steak in line and spices, and then grill it up and serve it warm corn tortillas with a lime avocado and cherry tomato salsa…well. That is otherwise known as heaven on a plate. And since we are sending our grill into overdrive as the days get shorter (sob! ), this is one that we will definitely be tucking into a few times before the first leaves fall. Let’s make it!The humans are not the only taco fans in the house. Please behold the family pooch with her very own fish taco. The picture is all kinds of blurry because when she has a stuffed squeaky fish taco between her teeth, she is not interested in slowing down to get her picture taken. Nope, at that moment she was going through her nightly agonizing dilemma of REALLY WANTING someone to throw the taco for her to chase while at the same time REALLY WANTING to not let the taco go. #dogissues. Meanwhile in the kitchen, the humans are marinating skirt steak in a bath of lime juice and crush garlic and a little vinegar and red pepper. While one human is outside grilling it, the other human is mixing up an easy rustic salsa of cherry tomatoes, avocado, more lime juice and sea salt, and warming up some corn tortillas (and by the way, if you are a flour tortilla kind of person, go for it). Once the steak is off the grill, let it rest for about 10 minutes and then slice it up into thin strips…and after that, you know what to do. Pile that tortilla up with steak and salsa and have at it. And while I would definitely chase this taco if it really came down to it, I would pick not letting it go Every Single Time. No dilemma here! Put steak, garlic and olive oil in a zippered plastic bag. Cut two limes in half and squeeze the juice into the bag. Drop the lime peels into the bag too, along with a generous pinch each of salt and pepper. Marinate in the fridge for 1-3 hours. When you are ready to cook, heat the grill to medium high and cook the steak for 3-4 minutes per side for medium rare. Let it rest under foil for about 10 minutes while you prepare the salsa. Combine tomatoes, avocado, the juice from the third lime and a pinch of salt and stir gently. Heat the tortillas (about 30 seconds in the microwave, or you can wrap them in foil and heat them for a few minutes on the still-warm grill. Slice the steak into thin strips and divide steak and salsa among tortillas and serve. We use our grill year ’round. Yes, even when it’s snow on the ground, lol :D Hubby goes out with a warm jacket, boots and cap and way to go! Your fur baby is so adorable! Our little guy loves toys, but they better be heavy duty ’cause he loves chewing them up looking for the squeaker…and he is less than 20lbs! This does look like a taco worth chasing! 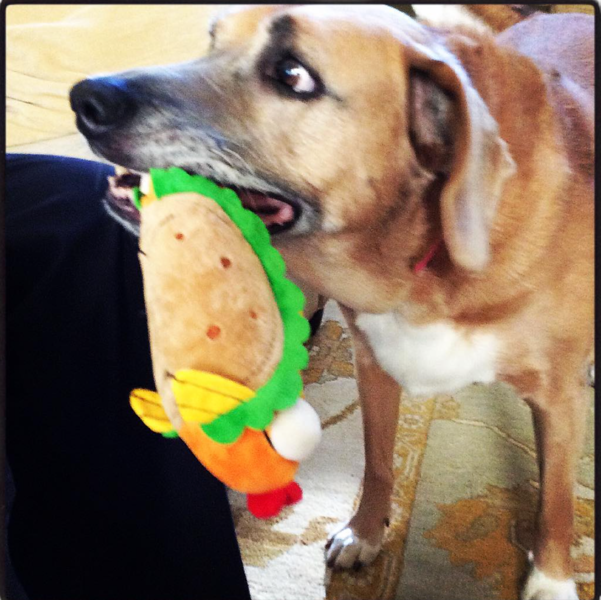 :) I love that your dog has a taco toy! This steak taco looks like serious business full of all sorts of yumminess! What a cute pup and delicious looking dinner! My dog Dixie has similar issues ;) Just as long as she’s not trying to take my real tacos, I’m OK with it! These look fantastic – a great way to keep the grill going just a little while longer… not ready… to let go… of summer… Sigh. Ahhh, too fun!! How did we not know this?!? Your steak tacos look great and I’m sure that taste equally good.